T/O little Snoring 2025 - target Peenemunde, Germany. Crew on 3rd operation. Crashed at 0214 hours at Ostersoen 1 mile SE of Gedser, Denmark. Route: 5510N 0700E - 5520N 0829E - PEENEMUNDE - MANO - 5510N 0700E. 596 aircraft - 324 Lancasters, 218 Halifaxes, 54 Stirlings. This was the first raid in which 6 (Canadian) Group operated Lancaster aircraft. 426 Squadron dispatched 9 Lancaster IIs, losing 2 aircraft including that of the squadron commander, Wing Commander L Crooks, DSO, DFC. This was a special raid which Bomber Command was ordered to carry out against the German research establishment on the Baltic coast where V2 rockets were being built and tested. The raid was carried out in moonlight to increase the chances of success. There were several novel features:- there was a Master Bomber controlling a full-scale Bomber Command raid for the first time; There were three aiming points - the scientists' and workers' living quarters, the rocket factory and the experimental station. The Pathfinders employed a special plan with crews designated as 'shifters', who attempted to move the marking from one part of the target to another as the raid progressed; Crews of No 5 Group; bombing in the last wave of the attack, had practised the 'time-and-distance' bombing method as an alternative method for their part in the raid. The Pathfinders found Peenemünde without difficulty in the moonlight and the Master Bomber controlled the raid successfully throughout. A Mosquito diversion to Berlin drew off most of the German night-fighters for the first 2 of the raid's 3 phases. (one loss). The estimate has appeared in many sources that this raid set back the V-2 experimental programme by at least 2 months and reduced the scale of the eventual rocket attack. Most of the casualties were suffered by the aircraft of the last wave when the German night fighters arrived in force. This was the first night on which the Germans used their new schräge Musik weapons; these were twin upward-firing cannons fitted in the cockpit of Me 110s. Two schräge Musik aircraft found the bomber stream flying home from Peenemünde and are believed to have shot down 6 of the bombers lost on the raid. Son of Frederick William and Ethel Henrietta Pusey, of Wotton-under-Edge, Gloucestershire. 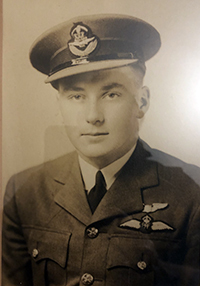 *He was one of a small number of RAF personnel entitled to wear both RAF and USAF wings as he trained in the US and then stayed to train both RAF and USAF pilots hence he had to have his American qualification and earned there wings as well. Source: CWGC - *info via Graham Sturrock, photo via his mum, Diana Margaret Sturrock (maiden name Pusey, born 14/1/1925 - died 24/8/2011) sister of Frederick. Son of Thomas Phillips Leonard and Dorothy Leonard, of Prudhoe, Northumberland. Runnymede Memorial - panel 156. Son of Roy and Lilian Bruton of Waterdown. Youngest of seven children. Runnymede Memorial - panel 173.
serving in the 3 Anti-Tank Regt. Royal Canadian Artillery. Husband of Winifred F. Howard, of Tue Brook, Liverpool. Runnymede Memorial - panel 154. 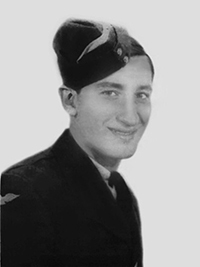 Son of Eric Grant Cable and Nellie Margaret Cable, of Radlett, Hertfordshire. Runnymede Memorial - panel 131. Son of William Edward and Nellie McKibbon, of Toronto, Ontario, Canada. Runnymede Memorial - panel 186. Source: CWGC - more photos and info on: Aircrew Remembered. Son of Florence Ellen Corbett and stepson of Richard Alfred Thurston, of South Lopham, Norfolk. Runnymede Memorial - panel 146.